Richard and Cecile Feagle opened Archer Automotive & Diesel Repair in April of 2004, with the help of their two sons, Justin, who was 17 years old and Ryan, who was 13 years old at the time. Richard was a fleet mechanic at Florida's largest independently owned pest control company for over 20 years, specializing in Diesel Engine work. He worked in his home shop after work for many years, and in 2003 decided to open his own shop. Richard and Cecile purchased the old Duke’s Garage building which was built in the 1920’s and were there for 11 years. Richard and Cecile built a new state-of-the-art facility with 8 bays, an alignment station, full diesel work area, large truck lift station, and family friendly waiting area in 2015. Our team of ASE Certified technicians are the best automotive and diesel mechanics in the business and will provide you with exceptional service backed by years of experience. Our new shop has all the tools needed to get the job done right. We will find the problem and take the time to explain the repairs and even show you the damaged parts. At Archer Automotive & Diesel Repair it's about more than the job, it's about getting it right the first time and getting you back on the road fast and at a fair price. 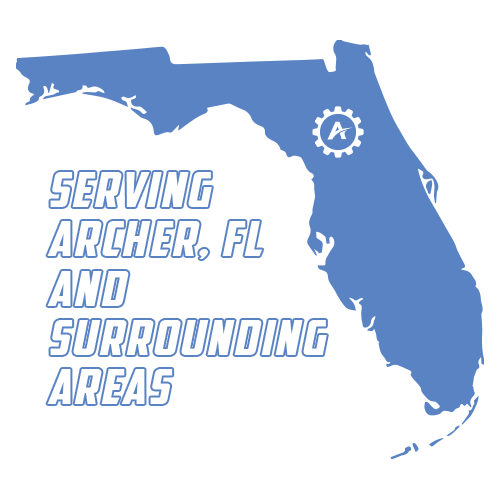 Stop by the shop and see why we have so many satisfied customers after more than a decade of serving the Archer and Gainesville, Florida area. Thank you for visiting Archer Automotive & Diesel Repair in Archer, Florida where we specialize in diesel truck repair but work on all size vehicles including foreign and domestic cars. We carry a full line of tires, provide comprehensive alignment work, RV repairs, fleet repairs, transmsission & engine replacements as well as the standard brake jobs, oil changes, and batteries. Our ASE certified technicians are the best in the business! Choosing our team will keep your car, truck, suv, or van on the roads longer and safer. Serving Archer and the Gainesville Florida Area.